As much as I abhor the phrase “taking it to the next level,” the writers of around just did. The show is picking up its pace in storytelling. Jake and Amelia come so close to meeting. Lucy makes a decision that starts her down a path of darkness. Guillermo takes an innocent life (i.e. A life deviates from his supposed path to glorify God or ridding the world of the 36 righteous ones. Does this make him a Godless murderer per Avram’s description? If he took the life of this holy man (Father Esteban), what is to stop him from killing Avram? I do understand they needed a mythology but if one reads about the righteous ones in the Talmud, there really is no way to rid the world of them. If one loses their way, God puts another on this path. Once any of these individuals knows they are part of this group, they are no longer one of them. But I’ll go along with this because the story is so compelling. This episode also ponders if the end justifies the means. Even love can be corrupted. All the people are operating from this point of view. Guillermo’s love of God is his motivation. Lucy’s mother-bear instincts to protect her daughter make her do the unthinkable in order to find her. Calvin’s love for his brother, and in part his guilt that arose from tragedy, motivates him to kidnap Amelia to find a way to heal his brother. Even Martin tells Calvin he will kill him if he touches Jake. Love is such a powerful motivator but it often blinds us on the path. Jake (David Mazouz) and Amelia (Saxon Sharbino) both dream of the moment they meet on the pier 29 at Marina Del Rey. “Human beings are hard-wired to connect. We are drawn to one another by our own chemistry. We produce attachment hormones that create intimacy. We build neural bridges that bond us, brain to brain, heart to heart. Those bonds, once formed, are not meant to be broken. Jake combed his hair for his first-ever play date with Soleil (Isabella Acres). But first waffles! Jake makes the microwave explode so the timer reads 8877. Tonight’s number. That means breakfast on the way to Soleil. Lucy (Maria Bello) is wearing a red-striped shirt. She tells Martin (Kiefer Sutherland) a sweet story about falling asleep with Amelia, but she has not done that for 1100 days. Kase (John Boyd) enters the restaurant and plays the arcade game next to Jake. Martin pays for breakfast [big red tomato on his plate]. Kase calls Calvin (Lukas Haas) and Calvin tells him to follow them and find out where they live. Father Esteban (Manuel Garcia-Rulfo) is asked to administer the sacrament of reconciliation. Martin passes a 7-Eleven (ironically the same colors of the Mexican flag) and sees Kase following them. Martin pulls into a parking garage, Kase follows, but Martin stops Kase’s car, pulls him out and beats him up. When security catches up to them, Martin leaves the scene. 7-Eleven looks like the Mexican flag. Jake heads into Soleil’s house where Martin and Lucy meet Soleil’s mom, Beth Friedman (Wendy Benson-Landes) and Soleil’s grandfather (remember that Frances Norburg and Carl Hirsch (Randy Oglesby) know each other from her former job). They go to make cupcakes. Jake takes Carl’s cell phone and scrolls to Frances’ name. Guillermo (Said Taghmaoui) feels he needs absolution to continue his mission to kill the 36, and Father Esteban is the unlucky priest to hear it. He says, “As a servant of God I know what I must do; as a man, it hurts”. [Remorse!] He confesses that he is one of the 36. [Talk about the ultimate self-hatred. That means that he ultimate plans to kill himself once the 35 are gone]. Father Esteban leaves the confessional when he cannot give him absolution. Guillermo runs out after him and they both see what each other looks like. Lucy and Martin tell Trevor what Calvin has been up to with Amelia and Jake. Martin confesses he lied to Lucy about the meeting with Calvin, and she gets all righteous about keeping secrets yet I do not see her tell him she went to the police. She says, “Truth–not truth–it’s either one or the other”. Martin tells Lucy that this has to be on Jake’s schedule. Amelia takes Frances’ phone and some money. The phone rings; it’s Jake! He puts 8877 into the phone. Amelia is so smart to cover her trail too. Kase comes into the kitchen and Amelia doubles over in pain [faking it, very well I might add by collapsing to the floor]. Kase and Amelia go to the hospital. She is whisked away while the doctor takes Kase to treat his injuries. Trevor finds information on the web about Frances Norburg. She has another child, William (David Hoflin)! 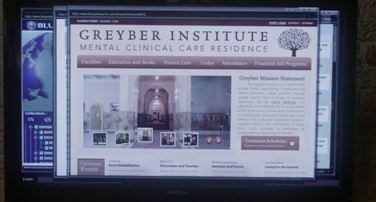 She is on the board of directors of The Greyber Institute (where William is) a private residence for neuroeducation made possible by a grant from–ta-da–Calvin Norburg. Martin and Lucy head over there. [The symbol of the Greyber Institute is the tree of life, the same symbol that is on Guillermo’s blade cover]. Once there Martin finds a door that requires a code and he puts in 8877 which he remembered from the microwave. They see Frances and William. Martin wants to get information first before they confront her. He pretends to have a wife at the facility. Frances seems like a decent human being. William was in an accident 4 years prior when the car Calvin was driving went into the water. William is in a “persistive vegetative state” but Frances believes he can understand her. Calvin is trying to find a way to get William communicating again. The cupcakes come out of the oven. [There is a bottle of oil on the cabinet that has the brand name “Star” next to another bottle that has red in it.]. “Star” brand oil. And more red. When Soleil looks for cupcake wrappers, Jake leaves out the back door. [Lots of red references on the cabinet island.]. Jake heads out to meet up with Amelia. At the hospital Amelia uses a hospital computer to find out where 8877 is. She leaves [with a red ambulance parked outside as she exits]. Martin tells Lucy what he learned. Carl calls Martin to tell him Jake is gone. He tells Lucy to take the car and see what she can find out. Meanwhile Kase calls Frances to tell her Amelia is gone. Father Esteban shares his encounter with Father San Felipo (Castulo Guerra) and says when he looked into Guillermo’s eyes it was like seeing the devil himself. He questions which is worse–to the break the seal of Canon law or to remain silent and allow others to die? Lucy visits with William and sees Calvin’s cell number 416-506-01?? She tells him there has been a breakthrough with his brother. Calvin is in his way. Martin sees bus 8877 heading to Marina Del Rey. Martin hops on. Jake enters the Oceanfront Arcade at 8877. He heads over to the Donkey Kong game [remember he plays that at BreakWire]. He scores 29 and puts in his name. Lucy introduces herself and threatens to kill William with a syringe filled with something. Security comes in and Lucy has to run for it (the syringe was filled with water). When she gets back in the car she calls Trevor to see if he can find more information. Amelia arrives at the arcade. Amelia gets closer to Jake. Kase and Frances figure out where she is headed and leave to get her. Amelia sees the Donkey Kong game. She plays, gets the same score and leaves her name [I guess it would be too easy if Jake hung out and just met her at the game, huh?]. Martin arrives. He sees the Donkey Kong game, takes a picture of it, sends it to Lucy and tells her to get over there now; it’s time. Father Esteban contemplates going into the police station. Calvin talks to William that he is making progress, getting closer. William shocks him when his thumb closes in on Calvin’s hand. William holds Calvin’s hand for the first time since the accident. Lucy meets up with Martin and he tells her to look for something with number 29. Lucy spots Amelia and runs towards her. Amelia smiles when she sees her mother. However Kase and Frances pull up, Frances opens the door. Kase grabs her and throws her in the car. Frances jumps in the back seat, Kase hops in the driver’s side and they drive off as Amelia hands hit the window. Jack embraces a grieving Lucy. Frances tries to justify Amelia’s abduction to Amelia, but all Amelia right now wants is her mother. In Mexico, Father Esteban wants to report a crime, but of course, he has to go to the bathroom first. Guillermo gives him a last chance to give him absolution. [Hard choice-absolution or death? I think I would pretend absolution with my fingers crossed behind him and the turn him in]. Poor Father Esteban; we hardly knew him. The ultimate red: Blood! Tears and a red blanket. Trevor calls Lucy with a lead to the foundation, “Mandelbrot”. [Mandelbrot was a famous mathematician where we got fractal geometry who recently died in 2010]. They just bought a loft downtown. Lucy goes alone and sees him. And she runs him over into the fence. This is not good. What a mother will do for her child.